Bistro Eloise had a sign out today that they were opening at 5 pm tonight. I called. They are open tonight, but cash only. Credit card system should be up and running tomorrow. 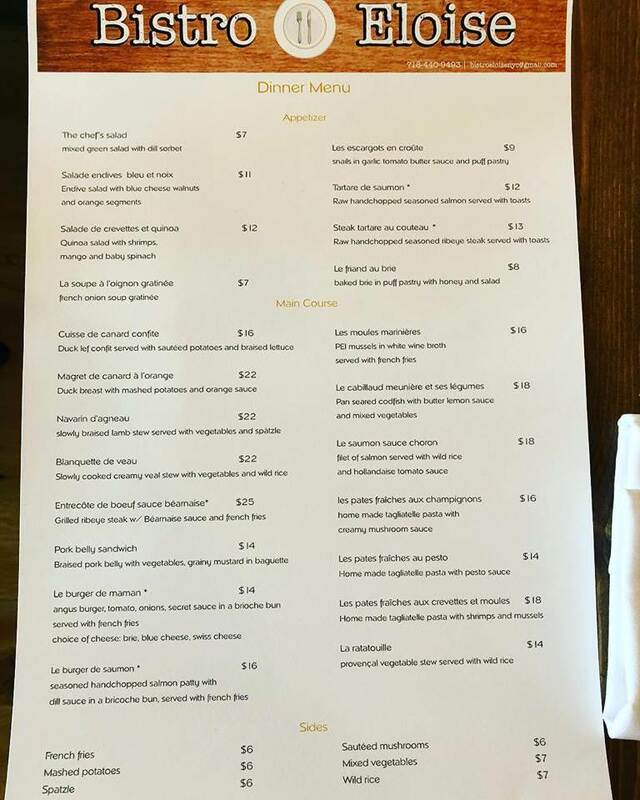 Bistro Eloise shared a photo of their menu. That looks great--I'm looking forward to trying it asap. they had me at steak tartare! I was hoping they'd be doing lunch too, but for now it looks like it's just dinner. They will be opening for brunch in the next week or two and plan to open for lunch in the next few weeks. Of course, plans sometimes go awry, but that's what the waiter told me when I ate there Wednesday night. Btw, the food was quite good. Surprisingly, there were a lot of French people at surrounding tables. Only $13 for steak tartare? radar but they are here. that's about standard for an appetizer portion. maybe two bucks more in midrange Manhattan places. looking forward to trying it out!